I am Paige MoonShade, I am a wizard from the game wizard101. Wizard101 is a MMOG one of the best family games I have seen. Let me tell you a bit about Paige .One day while listening to the TV I heard this commerical come on and its sounded really cool back in 2008 ,then it said visit wizard101.com of course I did ;). 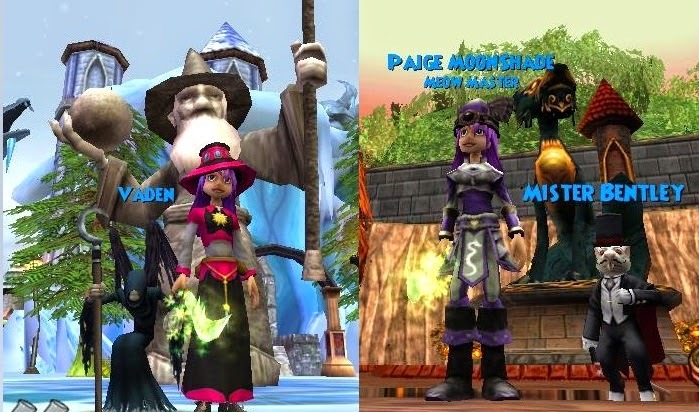 Paige MoonShade the very first one is a Death wizard ( above see before and after pictures). She was created by the test young wizards are given when they first make a wizard. Her first view of wizard101 and thoughts were nice graphics :) HeadMaster Ambrose gave me a task and off she went and hasn't stop yet. In days to come I hope to bring more thoughts and news from many other young wizards from the spiral. Hope to see you around the spiral. You need to work on the template now, make the site all it can be.